14.1. Why Learn About Classes? 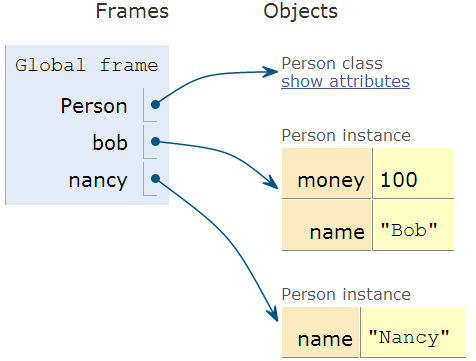 Objects have attributes, such as a person’s name, height, and age. Objects also have methods. Methods define what an object can do, like run, jump, or sit. Now imagine creating a program that has a set of variables like that for each character, monster, and item in our game. Then we need to create functions that work with those items. We’ve now waded into a quagmire of data. All of a sudden this doesn’t sound like fun at all. The def __init__(self): in a special function called a constructor that is run automatically when the class is created. We’ll discuss the constructor more in a bit. The self. is kind of like the pronoun my. When inside the class Address we are talking about my name, my city, etc. We don’t want to use self. outside of the class definition for Address, to refer to an Address field. Why? Because just like the pronoun “my,” it means someone totally different when said by a different person! 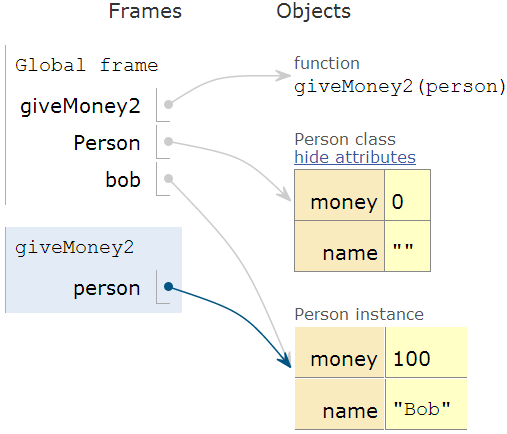 To better visualize classes and how they relate, programmers often make diagrams. 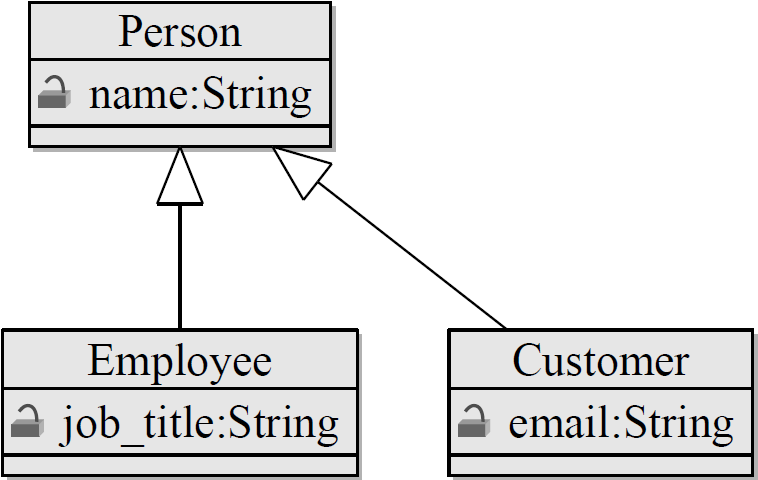 A diagram for the Address class would look like the figure below. See how the class name is on top with the name of each attribute listed below. To the right of each attribute is the data type, such as string or integer. If the bark function needs to make reference to any of the attributes, then it does so using the self reference variable. For example, we can change the Dog class so that when the dog barks, it also prints out the dog’s name. In the code below, the name attribute is accessed using a dot operator and the self reference. This example code could be used in Python/Arcade to draw a ball. Having all the parameters contained in a class makes data management easier. The diagram for the Ball class is shown in the figure below. The code above creates two instances of the Person() class, and using www.pythontutor.com we can visualize the two classes in the figure. What bob stores is a reference to the object. Besides reference, one may call this address, pointer, or handle. 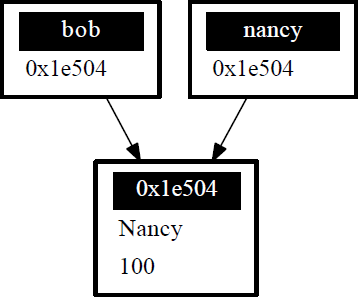 A reference is an address in computer memory for where the object is stored. This address is a hexadecimal number which, if printed out, might look something like 0x1e504. When line 9 is run, the address is copied rather than the entire object the address points to. See the figure below. Why is this? Because person contains a copy of the memory address of the object, not the actual object itself. One can think of it as a bank account number. The function has a copy of the bank account number, not a copy of the whole bank account. So using the copy of the bank account number to deposit 100 dollars causes Bob’s bank account balance to go up. There’s a terrible problem with our class for Dog listed below. When we create a dog, by default the dog has no name. Dogs should have names! We should not allow dogs to be born and then never be given a name. Yet the code below allows this to happen, and that dog will never have a name. One, add the submerge() command to our boat. This isn’t a great idea because we don’t want to give the impression that our boats normally submerge. Two, we could create a copy of the Boat class and call it Submarine. In this class we’d add the submerge() command. This is easy at first, but things become harder if we change the Boat class. A programmer would need to remember that we’d need to change not only the Boat class, but also make the same changes to the Submarine class. Keeping this code synchronized is time consuming and error-prone. The next code example is diagrammed out in the figure below. We have two options. We can run them both with super() keyword. Using super() followed by a dot operator, and then finally a method name allows you to call the parent’s version of the method. All constructors should call the parent constructor because then you’d have a child without a parent and that is just sad. In fact, some languages force this rule, but Python doesn’t. A parent class should always be a more general, abstract version of the child class. This type of child to parent relationship is called an is a relationship. For example, a parent class Animal could have a child class Dog. The dog is an animal. The Dog class could have a child class Poodle. The poodle is a dog, and is an animal. It does not work the other way! A dolphin is a mammal, but a mammal is not always a dolphin. So the class Dolphin should never be a parent to a class Mammal. Unrelated items that do not pass the is a test should not form parent/child relationships. For example, a class Table should not be a parent to a class Chair because a chair is not a table. The difference between static and instance variables is confusing. Thankfully it isn’t necessary to completely understand the difference right now. But if you stick with programming, it will be. Therefore we will briefly introduce it here. There are also some oddities with Python that kept me confused the first several years I’ve made this book available. So you might see older videos and examples where I get it wrong. 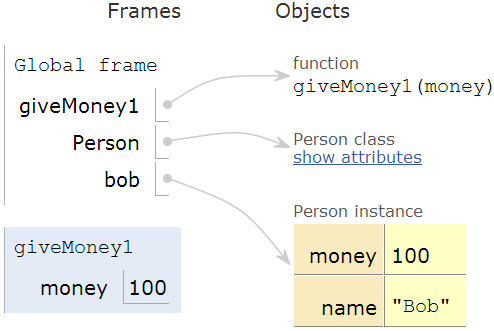 An instance variable is the type of class variable we’ve used so far. Each instance of the class gets its own value. For example, in a room full of people each person will have their own age. Some of the ages may be the same, but we still need to track each age individually. With instance variables, we can’t just say “age” with a room full of people. We need to specify whose age we are talking about. Also, if there are no people in the room, then referring to an age when there are no people to have an age makes no sense. 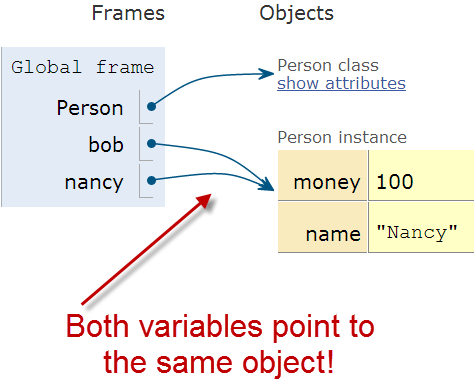 With static variables the value is the same for every single instance of the class. Even if there are no instances, there still is a value for a static variable. For example, we might have a count static variable for the number of Human classes in existence. No humans? The value is zero, but the count variable still exists. Line 22 prints out the instance variable, just like we’ve done in prior examples. Line 23 will generate an error because each instance of y is different (it is an instance variable after all) and we aren’t telling the computer what instance of ClassA we are talking about.